Today, the computation of thermal fields is highly sought for solving a large number of applied problems. They include simulation of heat treatment processes, welding, temperature conditions of machine-building constructions and electronic devices, ground freezing and thawing, and more. 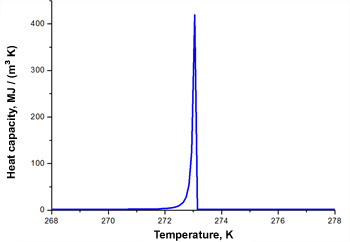 The computation of thermal fields is generally a nonlinear problem as the thermophysical properties of materials depend on temperature. The problem also becomes significantly more complex when phase transitions take place, as these phenomena involve abrupt changes in the thermal properties of the material and the release (or absorption) of heat. Computer simulation of all these processes is based on the numerical solution of the heat equation, i.e. differential equation in partial derivatives. Currently, the numerical solution of the heat equation is implemented in many existing software packages for computer simulation: ANSYS, SIMULIA Abaqus, COMSOL, and others. However, in the computation of thermal processes, the use of these software solutions is only possible on supercomputers or high-end workstations when the discretization of simulated objects requires millions of nodes. Simmakers has developed a numerical method for solving differential equations, which has a high degree of parallelization and requires a small amount of RAM. This allows computational software applying the Simmakers’ algorithms to use GPU resources effectively. The efficiency and advantages of the Simmakers technology is demonstrated in the following test problem: we have calculated the dynamics of the temperature field in a parallelepiped on the upper face for which the constant temperature of 246 K is specified, and zero heat flux on all the other faces. 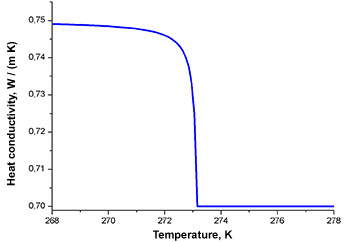 The overall initial temperature for the whole parallelepiped is 274.5 K. The dynamics of the temperature field for one year is simulated and the thermal properties of the materials are specified as nonlinear functions of temperature, which is typical of substances which undergo transition in the considered temperature range. The numerical solution of this problem was carried out on a hexahedral computational mesh using the software technology developed by Simmakers. 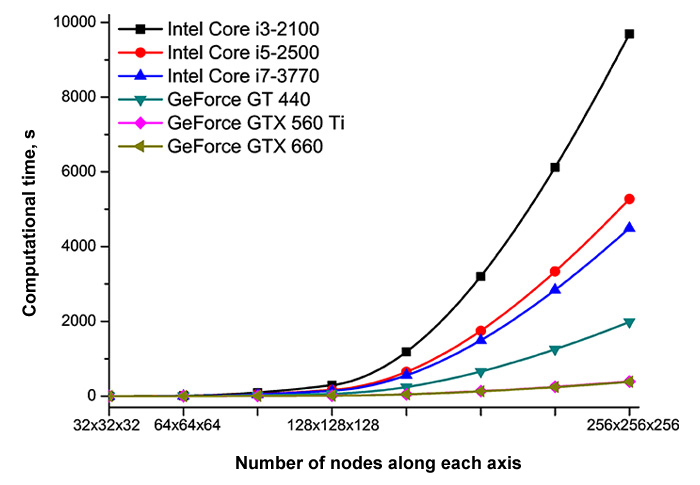 The figure below demonstrates the relationship between the size of the computational mesh and computation time with differing CPU and GPU models. Dmitry Evlanov, Managing Director of Simmakers, said: “The same accelerated computational speed achieved by our software is not possible in all other known software packages without the use of supercomputer capital. We’ve managed to achieve such extraordinary computational speed on a standard personal computer with a video card that supports CUDA. The development of this specialized simulation software therefore has clearly significant advantages over commercial software and we invite interested organizations to leverage our expertise in the development of such software”.